While discussing this passage, Lives Transforming looks at three radically different commentaries of Galatians to gain a well-rounded perspective of this church’s struggle between legalism and grace. In this passage, the Apostle Paul is speaking to the Galatian church about their crisis of faith. They had opened themselves to the influence of a group known as the Judaizers. This group was trying to convince the Gentile church that even though they had found salvation through faith in Christ, they were still required to follow all of the Old Testament Jewish laws. In moving through these verses, Wilder shares the perspectives of Dallas Theological Seminary, the theology of which the Lives Transforming team most aligns itself, as well as John Calvin and Martin Luther, well-known theologians from the Protestant Reformation. Whereas Martin Luther’s theological focus was on the concept of God’s transformation of the believer through justification and sanctification, John Calvin’s was on the importance of obedience and spiritual disciplines after becoming justified, the believer’s role in sanctification. 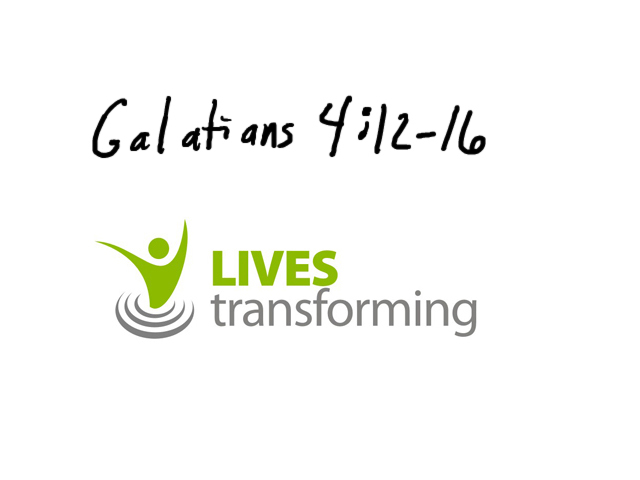 Paul starts out by appealing to the Galatians to become like him, because he had become like them. 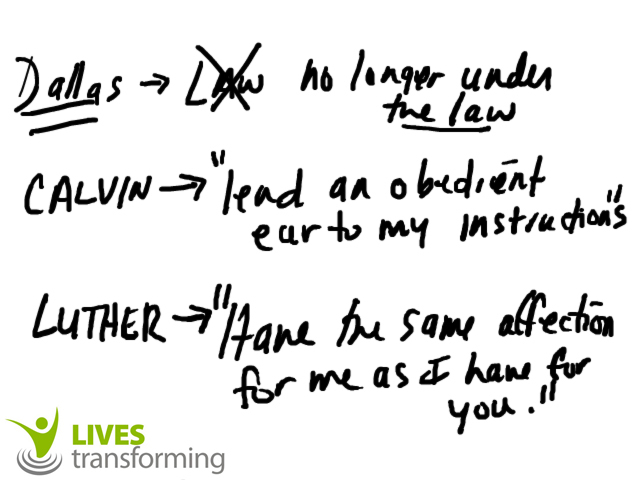 Dallas Theological Seminar thinks Paul was telling the Galatians to become ‘free from the law’ as he was, because he had left his former devotion to Judaism and become just like the other Gentiles in Christ. This view lines up more with Luther than Calvin. 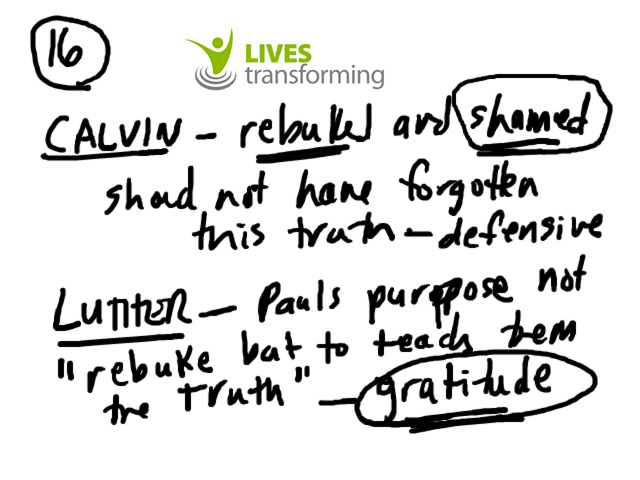 Calvin’s perspective on this verse was that Paul was telling the Galatians to listen to his instruction and model their lives after him as their role model. In the second part of the opening verse, Paul states that the Galatians have ‘done him no wrong.’ Dallas Theological Seminary and Luther’s commentary agree that Paul was showing a detachment from being personally hurt by the Galatians’ decisions. It was for them to choose, even after he had made his appeal. Calvin, however, views it as a concession on Paul’s part that he had been harsh previously and now needed to be gentle with them, as their disciplinarian. The next few verses deal with Paul’s ‘bodily illness’ and, and again, there are three theories presented about what it was. 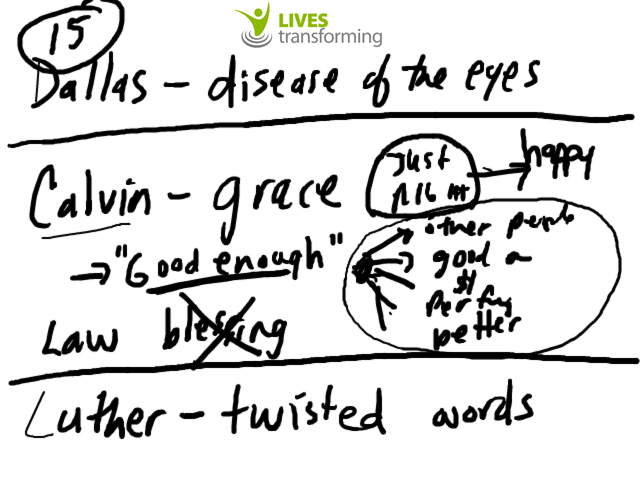 Dallas Theological Seminary proposes a theory that it could have been an eye disease, considering the reference to the Galatians’ willingness to “pluck out their eyes”, if necessary, to help Paul. Whatever disease it was, they believe it was an actual illness. 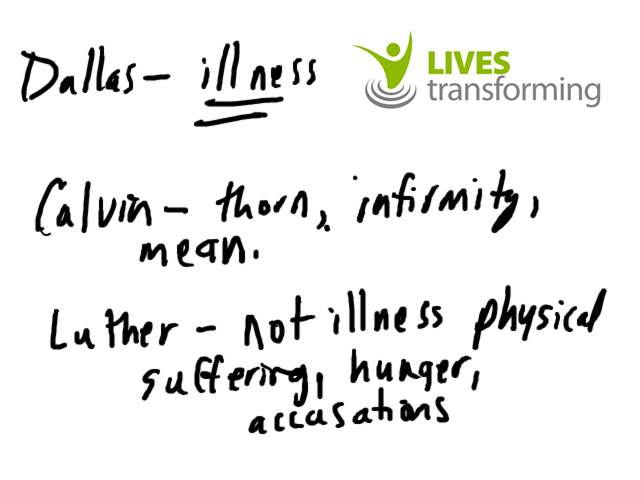 Luther differs from this and believes that it was a trial or some form of suffering, such as hunger, not an illness. He believes that Paul was feeling betrayed by the Galatians’ change of heart towards him because they had allowed the Judaizers to change the meaning of his message, a personal attack that Luther would have identified with. Derek draws special attention to Calvin’s commentary on this group of verses. Calvin believed that Paul was referring in this passage to his ‘thorn in the flesh’ referenced elsewhere in the epistles, and that he was excusing his harsh behavior due to dealing with his thorn. However, Paul praises the Galatians’ treatment of himself in spite of his condition; they received him as if he was Jesus’ himself. Calvin points out the humility and honesty of Paul, as he was willing to admit his faults, his weaknesses, to the Galatians. He contrasts this to the pope of his time, who, on the other hand, was pompous and pretentious. 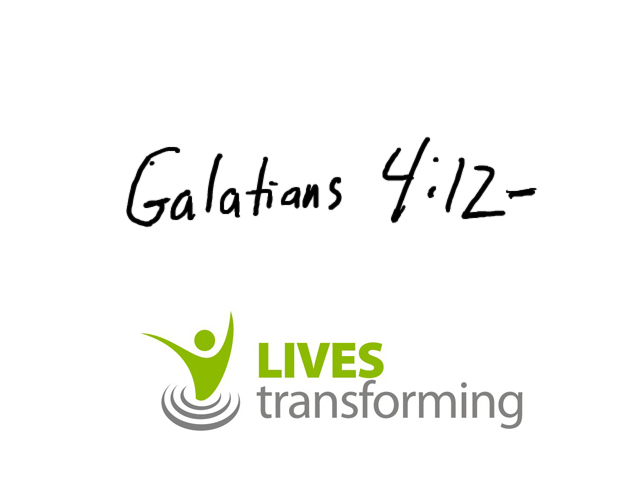 Paul is incredulous that the Galatians had left their ‘blessing’ of freedom in Christ, their happiness, to go back to a performance-driven life under the law. In the final verse of this passage, Paul asks the Galatians if it is necessary for him to be their enemy because he has spoken the truth. 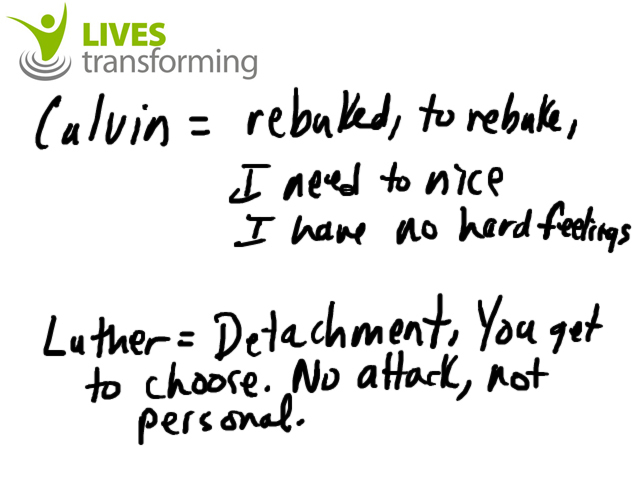 Lives Transforming’s view is closest to Luther’s perspective on this verse. 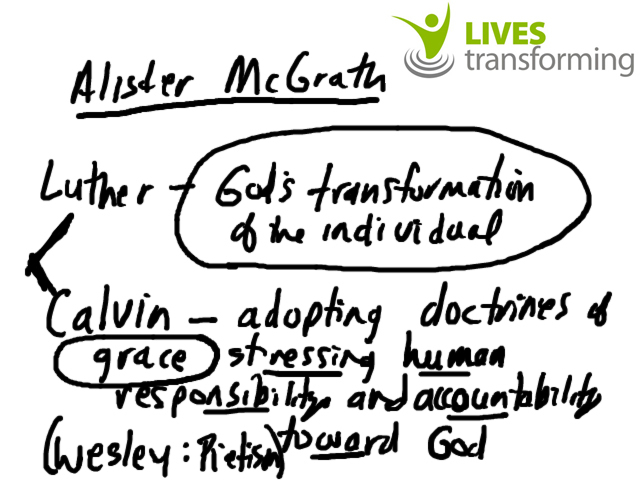 Luther believes Paul viewed his instruction to the Galatians as teaching, which should excite gratitude. 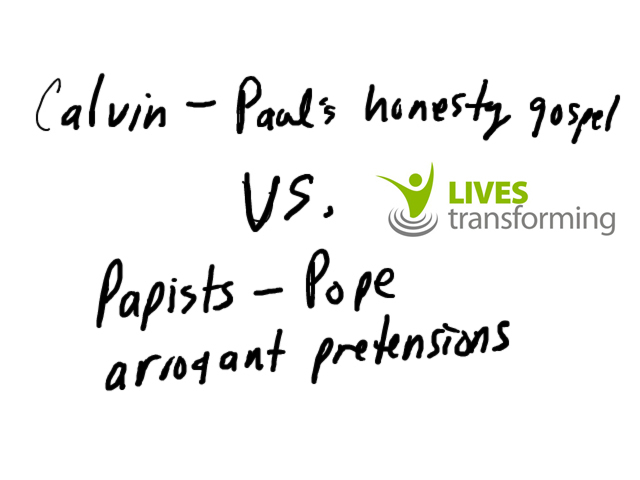 Calvin, however, saw Paul’s actions as a rebuke and a shaming that had incited their anger.